Carmen Quagliata specializes in farm-fresh ingredients with big Italian flavors. 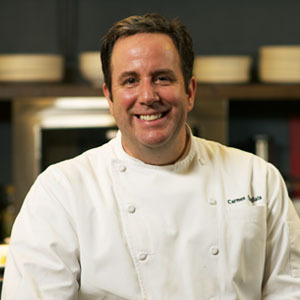 Since 2007, he has served as Executive Chef of New York's Union Square Cafe, which has received the title of Zagat Guide's Most Popular Restaurant in NYC an unprecedented nine times. Quagliata continues to rely on the nearby Union Square Market and his deep Italian roots as his inspirations. In fact, he still finds time to grow the beans brought to America by his grandmother from Italy. Quagliata had previously worked under renowned chefs Michael Chiarello and Lidia Bastianich and at the Greenbrier Hotel in West Virginia. Before that, he attended the Culinary Institute of America.